When introducing their EOS R and the RF lens mount, Canon of course introduced compatible lenses and the RF 35mm f/1.8mm f/1.8 IS STM Macro Lens was one of them. Most of the newly-introduced RF lenses were very high end L-series models with moderate to very high price tags and some were rather large with relatively heavy weights. The RF 35mm f/1.8 f/1.8 was different and it flew under the radar of many photographers. This lens was priced less than half as much as the least expensive other RF lens announced. Also very notable was that the RF 35mm f/1.8 f/1.8 weighed less than half as much as those other options. And, it was quite compact. Especially attractive characteristics of the EOS R are its light weight and compact size and the RF 35mm f/1.8mm is highly complementary in both regards. The 35mm focal length is highly regarded for its general purpose utility and a wide aperture along with image stabilization and 0.50x (1:2) macro capability greatly extend that utility. Good AF performance and sharp image quality are two more reasons to like this lens. 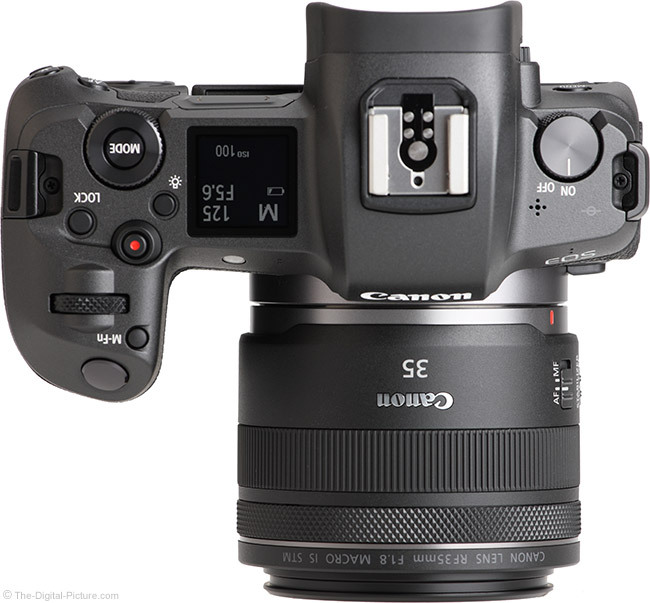 Note that you will need an RF-mount camera (the EOS R-series) to use the RF 35mm f/1.8mm lens on. I already mentioned the general purpose utility of the 35mm focal length and that is a great reason for selecting this lens – or any 35mm lens as the angle of view should be shared across all models. The focal length determines the angle of view and the angle of view in turn determines the distance required (perspective) for the desired subject framing. Photojournalists often make the 35mm focal length their first choice. Portrait and wedding photographers love the 35mm focal length for full to mid-body portraits and for group portraits. 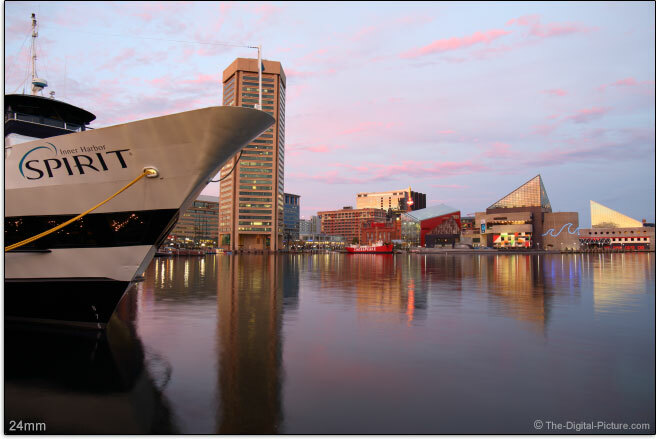 Landscape photographers have plenty of use for the 35mm focal length. Sports photographers able to get close to their subjects (such as basketball shot from over or under the net) or wanting to capture a wider/environmental view of their events appreciate this focal length. Parents love 35mm lenses for capturing their indoor events. 35mm is also very popular with videographers, especially for creating documentaries. Regardless of the focal length, that this lens has macro/close-up capabilities vastly extends the usefulness of the 35mm focal length, with food, tiny products, rings, flowers and a wide range of additional small-to-large subjects easily covered. Note that most insects would prefer you to have a longer focal length when photographing them as they find close lenses scary. All kinds of flowers are excellent 35mm macro subjects. Not sure what to do with all of the artwork your kids (or grandkids create)? Photograph it. Then you can mentally rest as you file the precious work of art, either in the long-term storage archive box or in the circular file. Either way, you will appreciate having the memories saved for easy viewing at a later time. As the artwork improves, this Rembrandt-ready lens stands ready to capture artistic impressiveness. Want to pick a lens to walk around looking for images to be made with? This one raises its hand as subjects for it abound. I've only scratched the surface of the list of uses here. To visualize where 35mm fits among other common focal lengths, I'll borrow a focal length range example from the Canon EF 24-105mm f/3.5-5.6 IS STM Lens review. At review time, this lens is not compatible with any APS-C (1.6x FOVCF) format cameras. Should that scenario change in the future, or should an R-series cameras' 1.6 crop mode be used, the full frame angle of view equivalent becomes 56mm. The 56mm angle of view is close enough to 50mm to be used for all applications this extremely popular "normal" focal length is used for. Those uses coincide with most uses of the 35mm focal length with slightly tighter framing or slightly longer perspective for the same subject framing being the difference. The basics: the lower the aperture number, the more light the lens will allow to reach the sensor. Each "stop" in aperture change (examples: f/2, f/2.8, f/4.0, f/5.6, f/8, f/11) increases or reduces the amount of light reaching the sensor by a factor of 2x (a big deal). Important is that allowing more light to reach the sensor permits freezing action, handholding the camera in lower light levels and/or the use of a lower (less noisy) ISO setting. Lenses with wider apertures generally outperform narrower aperture lenses in regards to autofocus, especially in low light situations. The advantages of a narrow aperture, because the lens elements can be reduced significantly in size, include lighter weight and lower cost, two things that we all can appreciate. While this lens does not have the widest aperture in the 35mm prime lens class, f/1.8 is still rather wide. F/1.8 is a huge 2 1/3 stops wider than the original EOS R kit lens, the Canon RF 24-105mm f/4L IS USM Lens. The RF 35mm f/1.8's f/1.8 max aperture is also 1/3 stop wider than the slightly larger but still compact Canon EF 35mm f/2 IS USM Lens. Even with its broad aperture opening, this lens avoids the size, weight and cost penalties. Also valuable is that increasing the opening permits a stronger, better subject-isolating background blur (at equivalent focal lengths) via shallower depth of field. 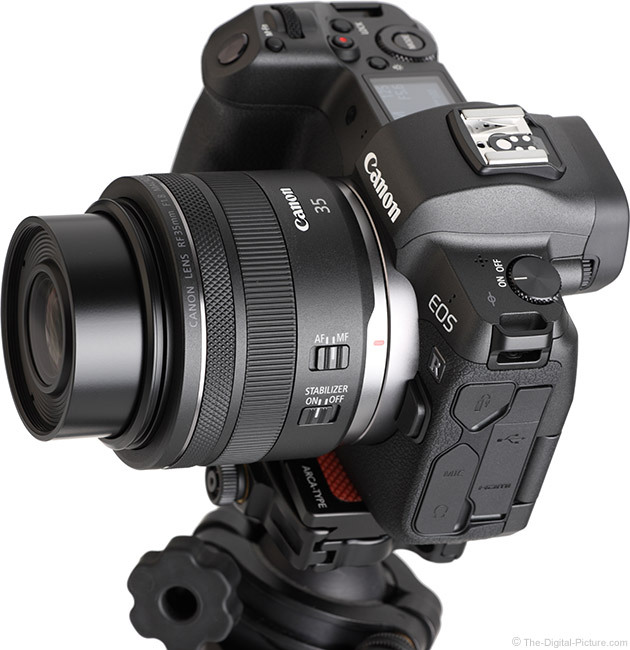 The Canon RF 35mm f/1.8mm f/1.8 IS STM Macro Lens is a good choice for low light photography needs. 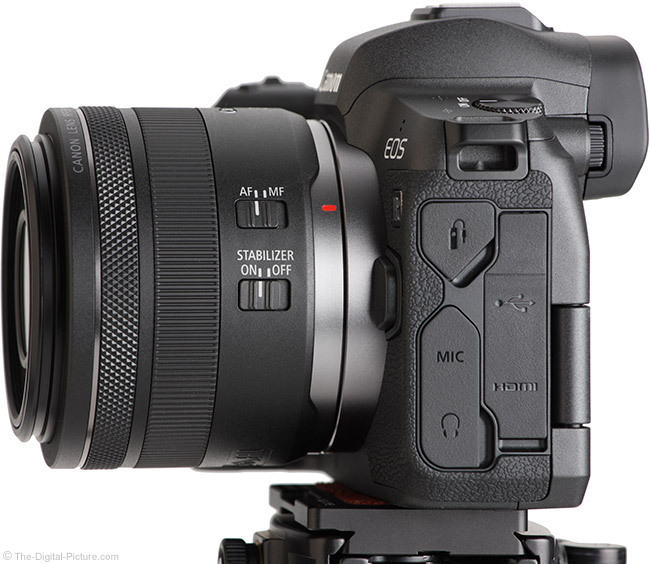 Making the RF 35mm f/1.8mm an even better choice for many low light needs is image stabilization. While image stabilization is not useful for stopping subject motion, it is incredibly useful for stopping camera motion and this feature greatly extends the versatility of this lens. Having a still image presented to the AF system also enables it to be more precise. The Canon RF 35mm f/1.8mm f/1.8 IS STM Macro Lens' IS system features an impressive CIPA 5-stops of assistance rating and also features Hybrid IS which compensates for both angular and shift camera motion. To test the real-world-for-me image stabilization assistance amount, I set the camera to Tv mode and capture a solid number of handheld test images at increasingly-long exposures, ranging from most-are-sharp through all-are-blurry settings. I then go through all of the images, marking those that are sharp, those that are close to sharp and those that are not. Usually, I can identify shutter speeds where there is strong drop in the sharpness rate for reporting in a review. I struggled with this round of testing. Some of my 1/4 seconds images are blurry and about 1/3 of my 1.3 second exposures are sharp. Perhaps I was improving my technique as the test went on, but ... that rate for crazy-long 1.3 second handheld exposures is really good. Most images captured at longer than 1/3 second were blurry, so a bit of a wall was encountered at that point. While I would like to have seen better results at the shorter exposures, the results at the longer exposures were quite impressive. The RF 35mm f/1.8's IS system is very quiet, with a barely audible "hmmm" heard only with an ear close to the lens (a slightly-reduced sound is audible even when IS is switched off). When the camera is powered on/awake, this this lens' IS is also on (unless turned off via the switch) and that means when the electronic viewfinder is on IS is at work, in this case providing a very nicely stabilized view. No jumping or drifting occurs and stabilization while panning the camera remains smooth, an especially useful attribute for video recording. Notable is that, at review time, Canon has only one image stabilized lens with an aperture wider than this one, the EF 85mm f/1.4L IS USM Lens. I like to consider the max native aperture a lens would need to have to match the handholdability of an IS lens. An aperture 5 stops wider than f/1.8 is ... just crazy. The size, weight and price of such a lens would be even crazier. Whether you need to leave the tripod behind or just want the speed and freedom afforded by handholding, the RF 35mm f/1.8's image stabilization is there for you. 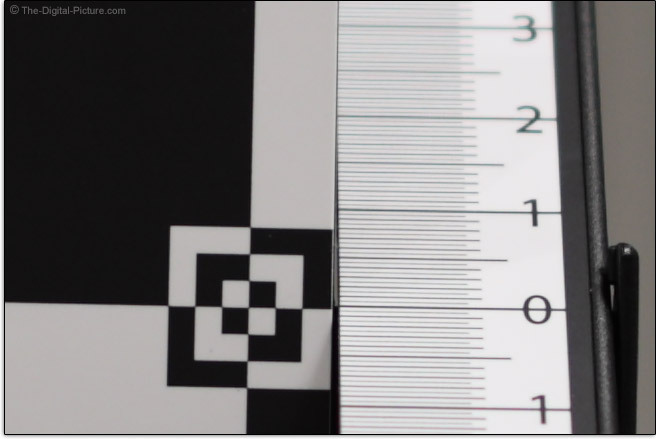 I usually have expectations for the image quality performance of a lens with the manufacturer-provided MTF chart contributing to that expectation. However, Canon has changed their MTF chart format, increasing the performance required for lines to reach the top of the chart. Thus, I was not quite as confident about what this lens would deliver, especially in terms of sharpness, contrast and resolution combined. Clearing everything up are the site's image quality test results and the description is simple. This lens has very good sharpness across the entire full frame image circle at f/1.8 and it has excellent sharpness at f/2.8. Improvements at f/4 are very minor with extreme corners showing slight improvement. Compare the RF with near-perfection to get an even better understanding of this lens' image quality performance. Taking the testing outdoors, I'll share some real world examples. The images below are 100% resolution crops from images captured in RAW format using a Canon EOS R MILC camera. The images were processed in Canon's Digital Photo Professional using the Standard Picture Style with sharpness set to "2". 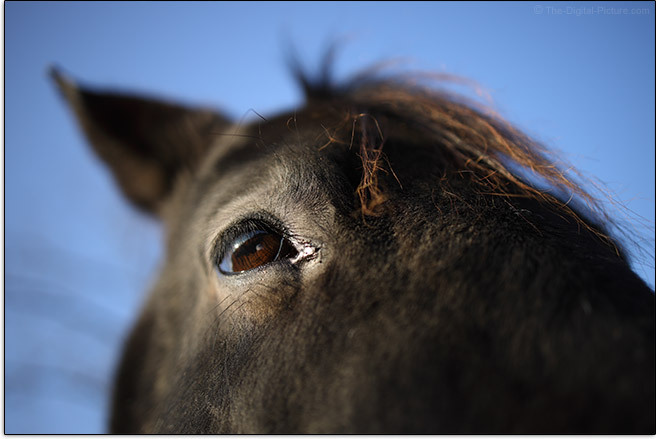 These examples are from the center of the frame and I'll start out with a picture of a horse that I was bothering. Again, be sure to discern the center of the plane of sharp focus in these examples. Also note that the in-focus area moves slightly rearward as the aperture is narrowed. This lens' focus shift (residual spherical aberration) is illustrated below. Watch how the "3" in the background gets sharper as narrower apertures are selected while the "1" in the foreground does not sharpen until a significantly narrower aperture is selected. The biggest concern, that subject at the intended focus distance remains sharp, is met. When shooting at narrower apertures, focusing somewhat in front of the subject could be warranted. To find a lens' worst image quality, the corners, being illuminated by the most-bent light waves, are the first place to look. Below are 100% resolution extreme corner crops processed the same as the center-of-the-frame sharpness examples. The first set is from the top-left corner and the second set is from the top-right. For an f/1.8 aperture, these corners are remarkably sharp and by f/4, especially helped by vignetting clearing, the image quality is remarkable. The new-at-review-time RF lenses feature the latest technologies available, but peripheral shading at wide apertures remains. At f/1.8, expect corners to show roughly 3.5 stops of shading (using the low-contrast neutral picture style). 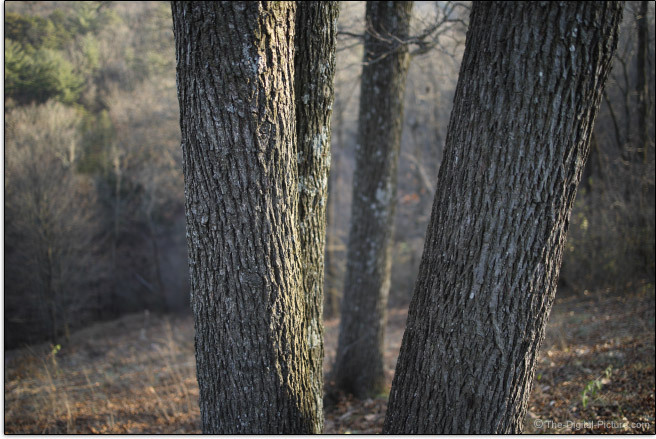 Use of a narrower aperture reduces the shading with only about 1.6 stops remaining at f/2.8. At f/4, about 1.2 stops shows in corners. While this amount is just-visible in some images, especially those with even colors in the corners (such as a clear blue sky), there is no additional improvement realized by stopping down further. Peripheral shading can be corrected during post processing with increased noise in the brightened areas being the penalty. Peripheral shading can also be simply embraced, using the effect to draw the viewer's eye to the center of the frame. One more note is the peripheral shading at f/1.8 can give an image "that look", an often desired characteristic. While lateral CA is usually easily corrected with software (often in the camera) by radially shifting the colors to coincide, it is of course better to not have it in the first place. 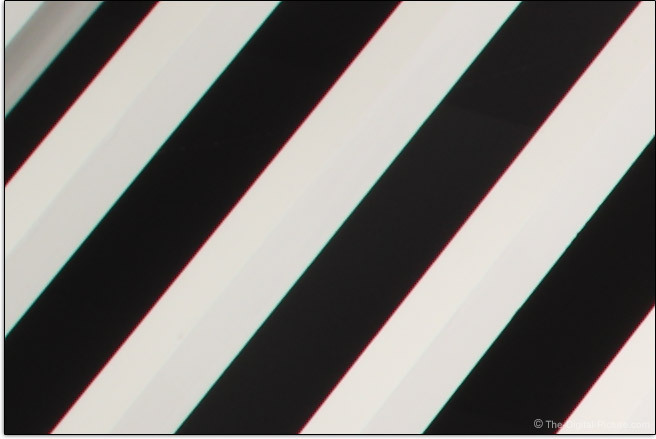 Any color misalignment present can easily be seen in the site's image quality tool, but let's also look at a worst-case example, a 100% crop taken from the extreme top left corner of an EOS R frame. There should be only black and white colors in this image and the additional colors are showing lateral CA. While the amount of lateral CA showing here is not extreme, it is rather strong for a prime lens. Prime lenses are often designed to significantly minimize lateral CA, but this lens shows a noticeable amount. In the above f/1.8 example, we see color fringing on the foreground out of focus highlights and the fringing color does not match the fringing color in the background. 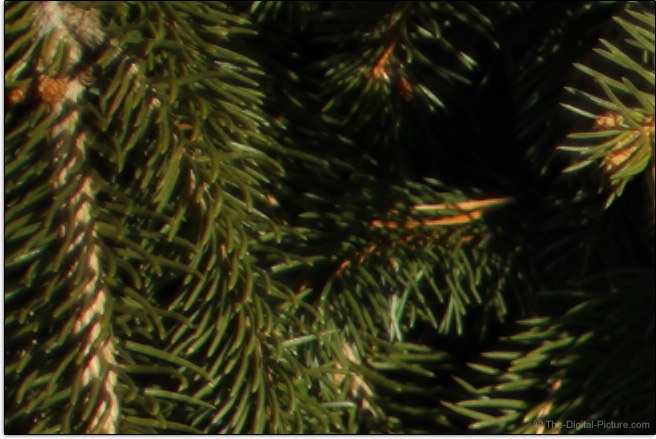 While the fringing colors are noticeable (moderate), the plane of sharp focus appears color-neutral and stopping down a couple of stops absolves the issue. If not embraced, flare effects can be destructive to image quality and this flaw is sometimes extremely difficult to remove in post processing. 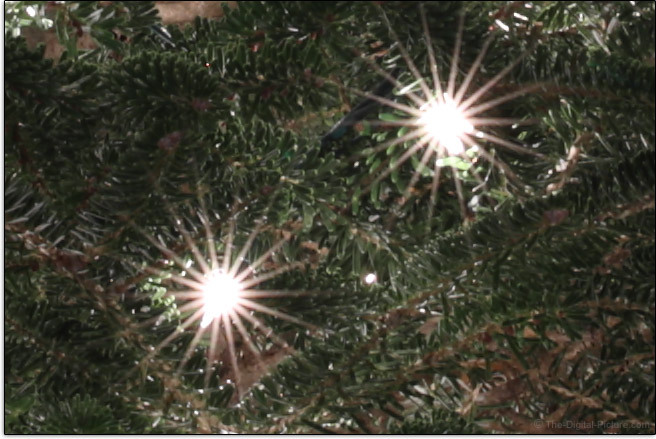 As a rule, the more lenses in an optical design, the stronger the lens will show flare. This one has a very low 11/9 lens/group count that, along with Super Spectra coating, makes this lens as flare-free as any we've tested. There are two lens aberrations that are particularly evident when shooting images of stars, mainly because bright points of light against a dark background make them easier to see. Coma occurs when light rays from a point of light spread out from that point, instead of being refocused as a point on the sensor. Coma is absent in the center of the frame, gets worse toward the edges/corners and generally appears as a comet-like or triangular tail of light which can be oriented either away from the center of the frame (external coma) or toward the center of the frame (internal coma). Astigmatism is seen as points of light spreading into a line, either meridional (radiating from the center of the image) or sagittal (perpendicular to meridional). These aberrations significantly resolve when the lens is stopped down. At f/1.8, those corner stars have huge wings. 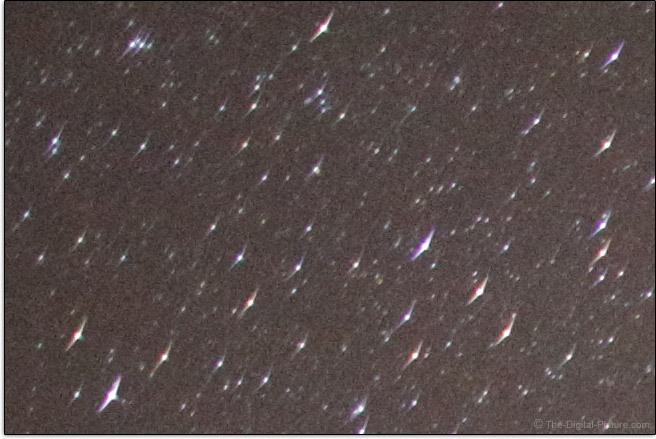 By f/4, the stars are very nicely rounded with essentially only the lateral CA remaining. This lens shows a small amount of barrel distortion, very similar to that of the Canon EF 35mm f/2 IS USM Lens. Most modern lenses have lens correction profiles available for the popular image processing applications and distortion can be easily removed using these, but distortion correction is destructive at the pixel level and this technique is seldom as good as using a distortion-free lens and focal length combination in the first place. 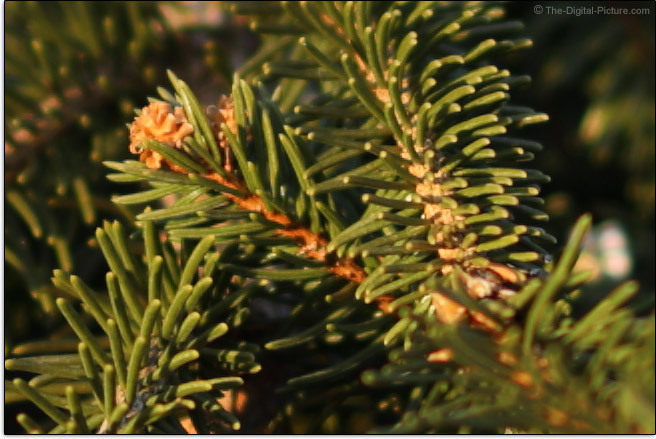 The first example is a 100% crop from an f/8-captured image showing out-of-focus specular highlights. These are rendered very smoothly with the periphery showing rather-straight lines from the strongly-closed aperture blades. The second example, also captured at f/8, shows an entire frame reduced in size. 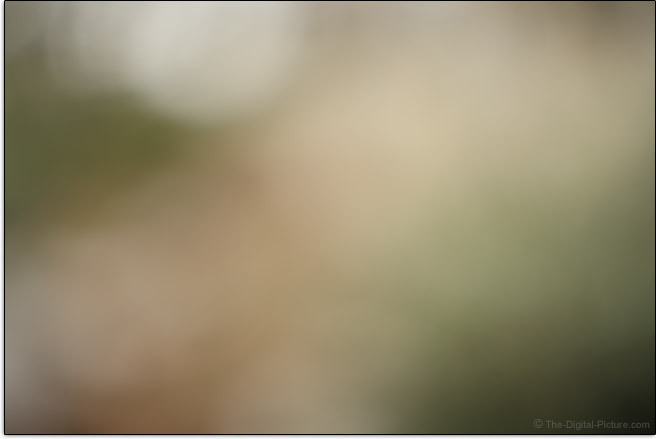 The bottom line is that I don't see any bokeh abnormalities coming from this lens. 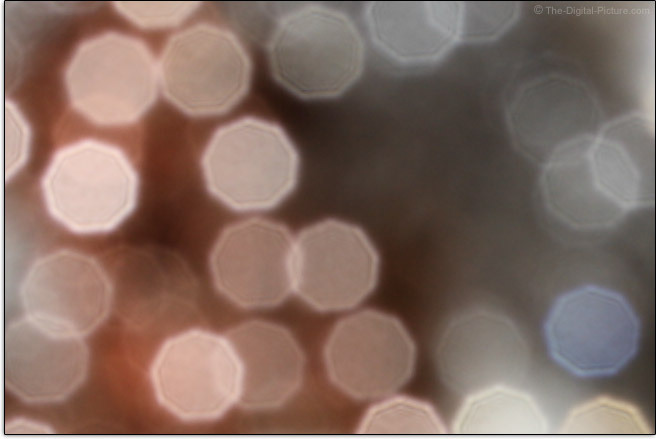 At f/1.8, cats eye bokeh, a form of mechanical vignetting, will be seen in the corners. Stopping down reduces the entrance pupil size and this mechanical vignetting absolves. With 9 aperture blades, point light sources showing a star-like effect will have 18 points and this lens produces stars with good shape. I mentioned the Canon EF 35mm f/2 IS USM Lens. 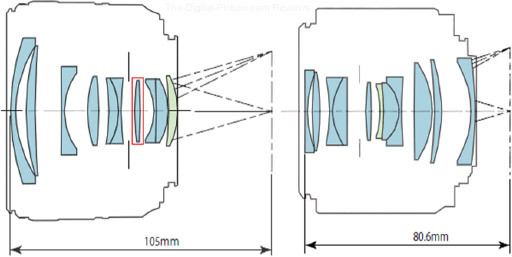 That is Canon's most-closely-related lens and its design is shown to the left of the RF 35mm f/1.8's design below. Overall, this lens is optically a strong-performer. Wide open image quality is very nice and modestly stopped down image quality is impressive. Critical for nearly most images is accurate focus and many of us rely on autofocus for that task. The EOS R has been impressive in this regard, accurately focusing with everything I mount on it and the RF 35mm f/1.8mm f/1.8 IS STM Macro Lens is not an exception. This lens features a stepping motor (the "STM" in the name) driven AF system that is quite fast with even long focus distance changes happening quickly. As usual, focusing in low light is slower, but the definition of low light is really dark for this lens. With an EOS R behind it, the RF 35mm f/1.8 will impressively focus on bright stars. The focusing is relatively quiet, though some light clunking is audible and a bit of a buzz is heard with long focus distance changes. This lens is not as quiet during autofocusing as the Canon RF 24-105mm f/4L IS USM Lens I recently reviewed and you can expect on-board audio recording to pick up these AF sounds. While the sound is deceptive from a smoothness perspective, the EOS R focuses this lens relatively smoothly (a benefit for video recording). Also note that this lens' aperture adjusts quietly and smoothly – it is ideally-suited for video recording under changing lighting conditions. This lens uses a front-focusing design with the first nine elements moving together to focus the lens. This design, along with the forward positioning of the diaphragm, permits a lighter focus group and provides a very short minimum focus distance. The RF 35mm f/1.8's focus ring is usable in size, but somewhat small and I sometimes find myself grasping the control ring when I wanted to manually focus the lens (especially when using with gloves). The ring turns smoothly for a very long 360° rotation to go between focus extents. The RF 35mm f/1.8 macro has a focus-by-wire or electrical manual focus system (vs. a direct gear-driven system) common for STM lenses. The manual focus ring electronically controls the focus of the lens. FTM (Full Time Manual) focusing is supported in AF mode with the camera in One Shot drive mode (if electronic manual focusing is enabled in the camera menu), but the shutter release must be half-pressed for the focus ring to become active. 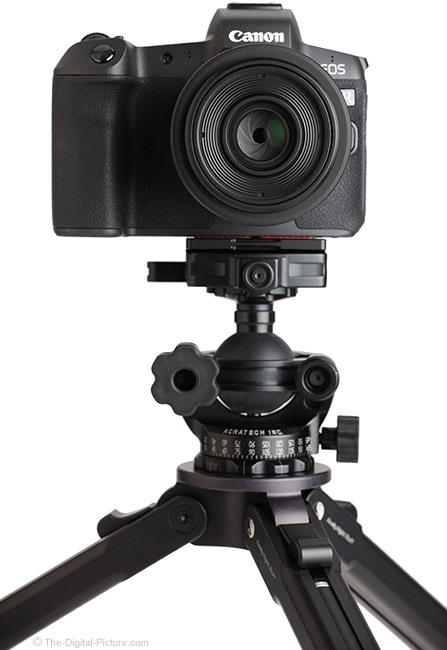 With the lens' AF/MF switch in the "MF" position, the camera meter must be on/awake for manual focusing to be available. With electronics driving AF, the rate of focus change caused by the focus ring can be electronically controlled and it can be variable, based on the ring's rotation speed. I never acclimated to that feature and with the R-series cameras, a linear (non-variable) adjustment speed can be configured and that has been my preference. As mentioned, the RF 35mm f/1.8 f/1.8 Macro Lens' focus is adjusted very slowly with 360° of ring rotation taking it from minimum focus distance to infinity. This allows very precise focusing. As that is a very long rotation for a lens that will likely see a good amount of macro and other-purpose use intermixed, I decided to try the variable sensitivity setting only to learn that this lens apparently does not have that feature. The ring continues to adjust focus linearly. Turn the focus ring too fast and nothing at all happens. While there is no play in the focus ring, annoying is that the image framing shifts slightly when changing focus ring direction. Also initially annoying is that manual focusing is not absolutely smooth with small steps being seen during focus adjustment. I said "initially" because after using the lens for a good amount of time, it seemed easier to find the ideal focus distance with the step adjustments. It is a bit like getting your eye exam – there were usually one or two steps that provided the ideal focus distance setting. Moderate subject magnification/framing changes are seen in the long full extent focus range change this lens avails. The RF 35mm f/1.8mm f/1.8 "Macro" has a 6.7" (170mm) minimum focus distance that delivers a 0.50x maximum magnification (1/2 half lifesize or 1:2 reproduction ratio). While that number falls short of what I usually look for in a serious macro lens (1.00x), it is an excellent spec for a 35mm lens with an f/1.8 aperture and the close-focusing feature gives this lens great versatility. Figure an about 2.8 x 1.9" (71 x 48mm) subject filling the frame at this lens' minimum focus distance. 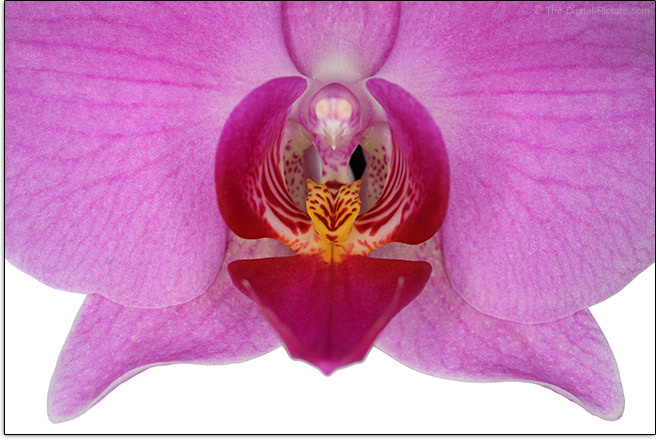 The bottom-most petals of the orchid below measure 2.4" (61mm) in width. The Canon EF-S 35mm f/2.8 Macro IS STM Lens featured a built-in ring light and it seems this lens could have similarly incorporated the same. What the RF 35mm f/1.8 does have are grooves to natively accept Canon's macro flashes (without an adaptor required). The MR-14EX was used to capture the above macro image. Magnification from wide angle lenses is generally significantly increased with the use of extension tubes, hollow tubes with electronic connections that shift a lens farther from the camera. As of review time, RF mount-compatible extension tubes do not exist. Watch for this accessory to become available and for those to significantly increase this lens' close focusing capabilities. From a physical perspective, the Canon RF 35mm f/1.8mm f/1.8 STM Macro Lens takes on the new RF lens style. Typical of lenses with front-focusing lens designs is extension during focusing with this lens reaching its maximum 0.69" (17.5mm) extension at minimum focus distance. Enable the "Retract lens on power off" setting in the camera menu to ensure that the lens is fully retracted after use. However, know that the lens will not retain its focus distance if the camera goes to sleep with that setting enabled. 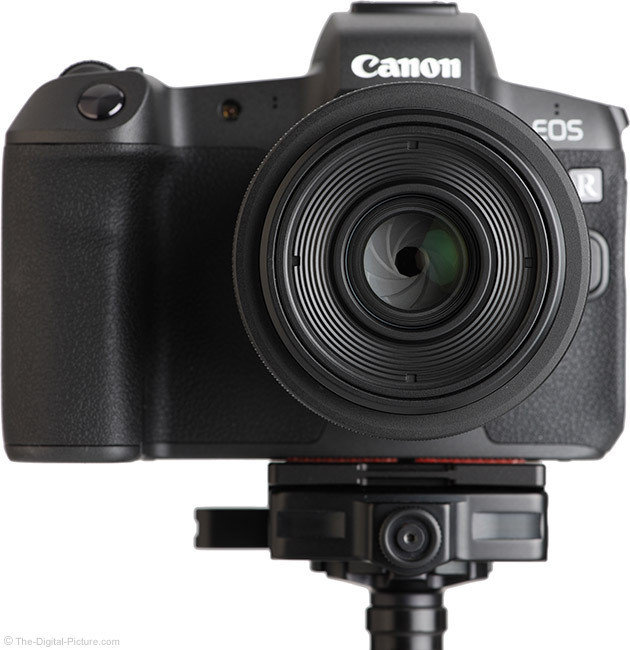 Canon's metal RF mount is attractive and is nicely shaped for mounting and dismounting the lens. Utilizing engineering plastic construction, the slightly-textured exterior barrel looks and feels nice, as does the straight exterior diameter of this design. The manual focus ring has a slightly-grippy ribbed surface with the control ring being strongly knurled for a tactile difference. RF lenses gain an additional ring, the "Control Ring" just referenced. 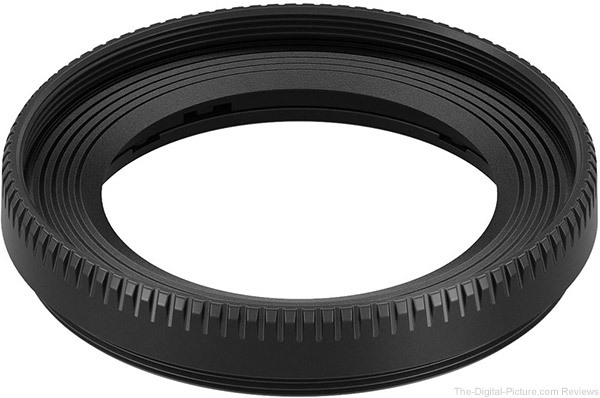 This ring is configurable for fast access to camera settings including aperture, ISO, and exposure compensation. Note that the control ring is clicked by default (54 clicks per rotation) and this ring's clicks are going to be audible in camera-based audio recordings. Canon offers a de-click service for the control ring (at a cost). The AF/MF and IS switches are flush-mounted with just enough raised surface area to be easily used, even with gloves. Interesting is that changing the AF/MF switch position opens the lens aperture momentarily and can retract/extend the lens when the camera is powered off (as can opening and closing the memory card door). This lens is not weather sealed. The front and rear elements of this lens are not fluorine coated with no explanation for that decision provided by the Canon developer group. The effort required to remove a fingerprint was moderate without this coating, as expected. This is a very small and light lens that will take up little space in your bag. This lens is effortless to carry all day. For many more comparisons, review the complete Canon RF 35mm f/1.8mm f/1.8 IS STM Macro Lens Specifications using the site's Lens Spec tool. 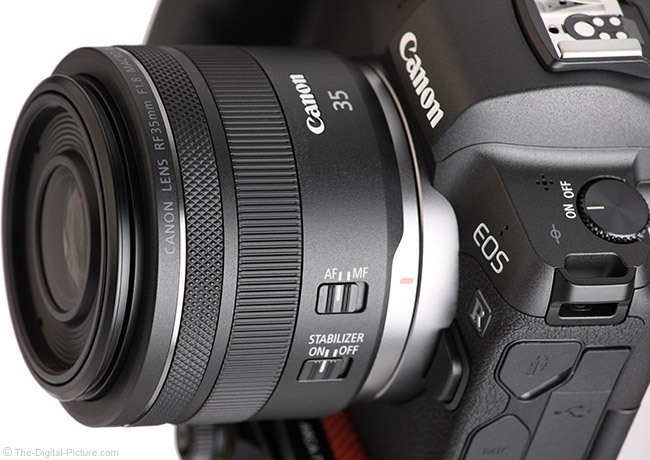 Positioned above to the left of the RF 35mm f/1.8 is the most equivalent EF lens, the Canon EF 35mm f/2 IS USM Lens. The first two RF lenses reviewed here are to the right, the Canon RF 24-105mm f/4L IS USM Lens and the Canon RF 50mm f/1.2L USM Lens. Use the site's product image comparison tool to visually compare the Canon RF 35mm f/1.8mm f/1.8 IS STM Macro Lens to other lenses. I've preloaded a different comparison in that link. Fitting for a small lens is a small filter thread size. This one is only 52mm. 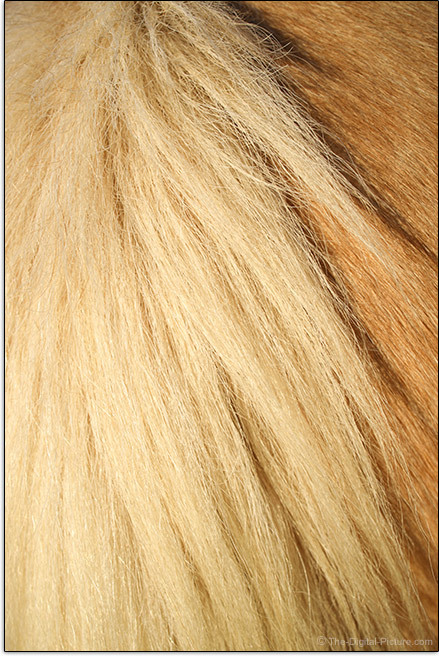 Filters of this size are small, light, inexpensive filters and reasonably common. A standard-thickness circular polarizer filter will impart slight mechanical vignetting, so I recommend a slim model such as the B+W XS-Pro or Breakthrough X4. As with most Canon non-professional series lenses, the lens hood is optional with the RF 35mm f/1.8. 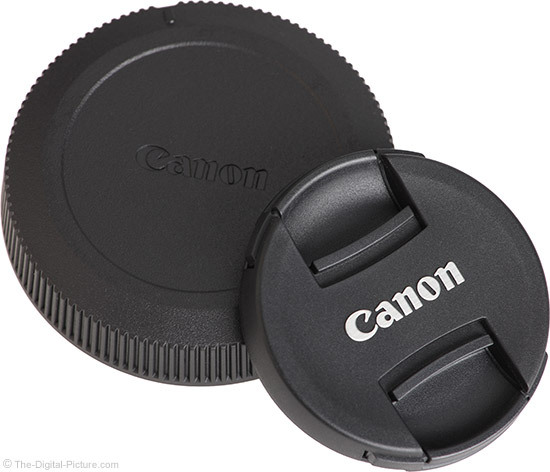 The Canon EW-52 Lens Hood is also expensive and tiny. The thread-on EW-52 is tiny enough that it does not provide much protection from bright light (though flare is not a problem with this lens) or impact and weather protection to the front element is minimal. This hood was not available when my lens shipped and I didn't consider it worth going back to order later. High cost and low utility equals a hard-to-justify purchase. Also excluded from the RF 35mm f/1.8 lens box was a case. Lens cases are generally not expensive and this one does not need a large model. Canon suggests their Lens Case LP1016, a drawstring pouch that adds dust and minor impact protection (though the bottom is well-padded). Consider a Lowepro Lens Case for a good quality, reasonably priced option. The RF 35mm f/1.8 of course comes with lens caps and Canon's are quite nice (an E-52 II arrives on the front). 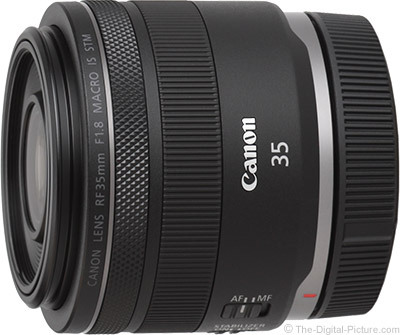 As mentioned in the beginning of the review, the Canon RF 35mm f/1.8mm f/1.8 IS STM Macro Lens was priced less than half as much as the next-higher-priced RF lens at its introduction. While I am certain that statement will not hold true indefinitely, this lens delivers very good image quality from a nicely-designed package that has a modest price and high utility. That all adds up to a good value. As an "RF" lens, the Canon RF 35mm f/1.8mm f/1.8 IS STM Macro Lens is compatible with all Canon EOS R series cameras. Canon USA provides a 1-year limited warranty. 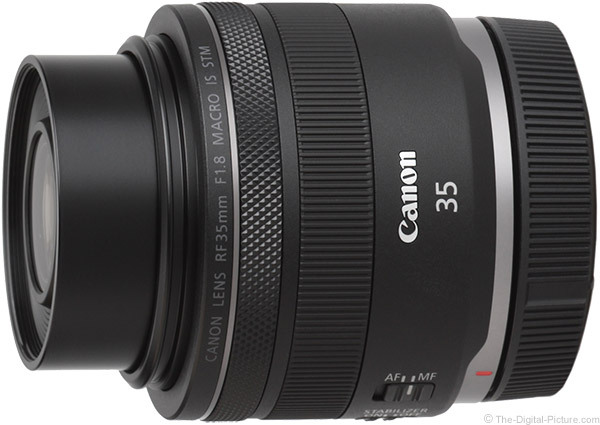 The reviewed Canon RF 35mm f/1.8mm f/1.8 IS STM Macro Lens was online-retail sourced. As of review time, there are no other RF 35mm f/1.8mm prime lenses. If you want to cover 35mm with a different lens, one of the RF zoom lenses is your option. Surprisingly, one of the RF zooms nearly matches this prime lens' max aperture opening. The Canon RF 28-70mm f/2L USM Lens trails by only 1/3 stop. The preproduction RF 28-70 I used was a phenomenal lens and a production model is sitting on my desk, next in line for review. While these two lenses have a 35mm focal length, wide aperture and great image quality in common, the RF 28-70 is more of an opposite in many regards. It is big (especially in diameter), heavy and very expensive. The differences are big enough that these two lenses are more complementary than they are competing. Moving outside of the RF family, an adapted EF mount lens is the option at this time. The Canon Mount Adapter EF-EOS R (or one of the variants) makes adaptation easy and maintains the adapted lens' native performance. There is a modest cost to the adapter and it adds .9" (24mm) in length and 3.9 oz (110g) in weight to any lens being adapted. The very popular Canon EF 35mm f/2 IS USM Lens, shown to the left above, seems to be the most relevant lens to compare. 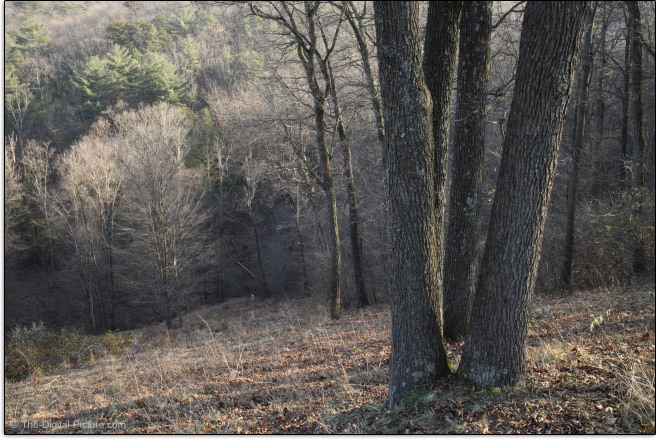 In the image quality comparison at f/2 (using discernment regarding the test camera resolution difference), these two lenses appear to be about the same. The RF lens shows slightly less flare and the EF lens shows slightly less distortion. Neither difference seems decision-making. 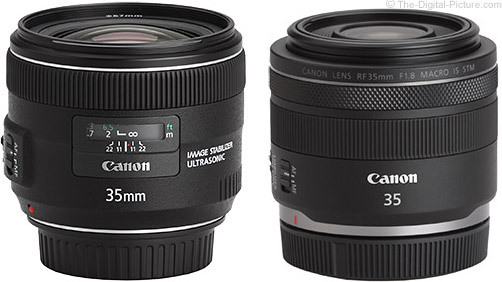 Looking at the specs and measurements, the Canon RF 35mm f/1.8mm f/1.8 IS STM Macro Lens vs. Canon EF 35mm f/2 IS USM Lens comparison shows the RF lens slightly narrower and slightly lighter while gaining a 1/3 stop max aperture advantage. The RF lens extends with focusing while the EF lens does not and the EF lens has a real lens hood. The RF lens gains an aperture blade (9 vs. 8) that produces 18-point stars vs. 8 points, has a 2x-higher maximum magnification (0.50x vs. 0.24x), has image stabilization rated to 5-stops vs. 4 and has 52mm filter threads while the EF lens takes 67mm filters. 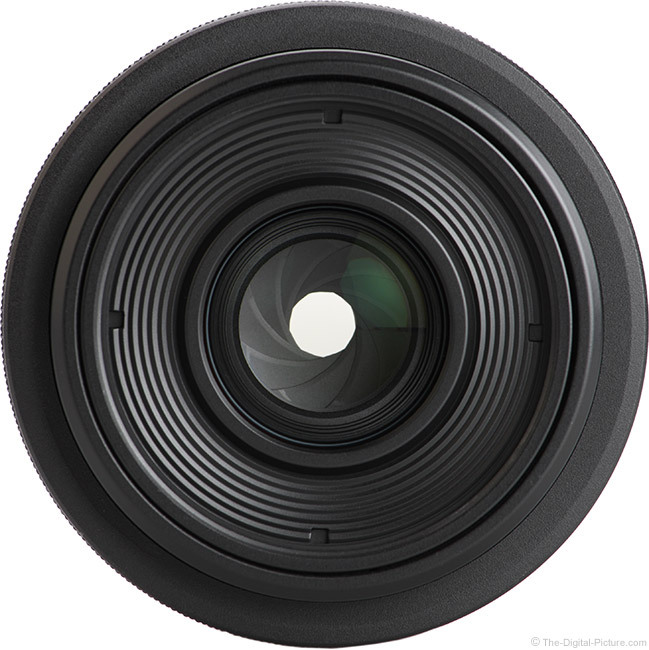 The RF lens has a 360° focus ring rotation whereas the EF has 145°. The RF lens has STM-driven AF while the EF lens is Ring-USM-driven. That the RF lens is modestly less expensive even without the adapter factored in is a definite advantage. 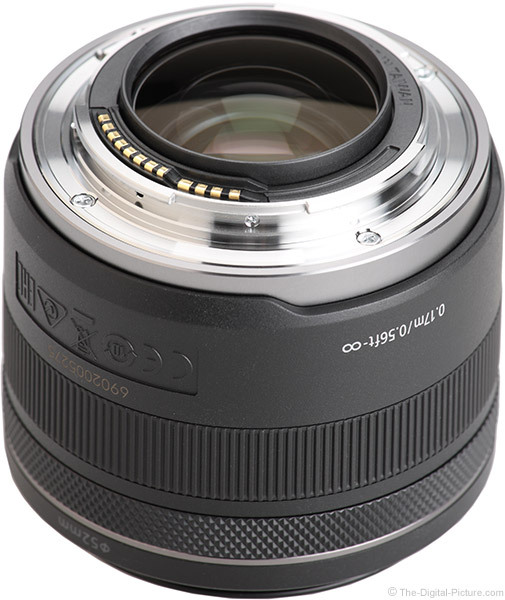 The Tamron 35mm f/1.8 Di VC USD Lens is a third party adaptable option with primary specs that align nicely with the RF 35mm f/1.8. In the image quality comparison at f/1.8 (again discerning between camera resolution differences), we see the two lenses performing rather similarly with the Canon appearing sharper in the center of the frame. By f/2, that slight difference is gone and the Tamron appears at least as sharp at f/2.8. The Tamron has noticeably less peripheral shading at f/1.8 and still modestly less at narrow apertures. 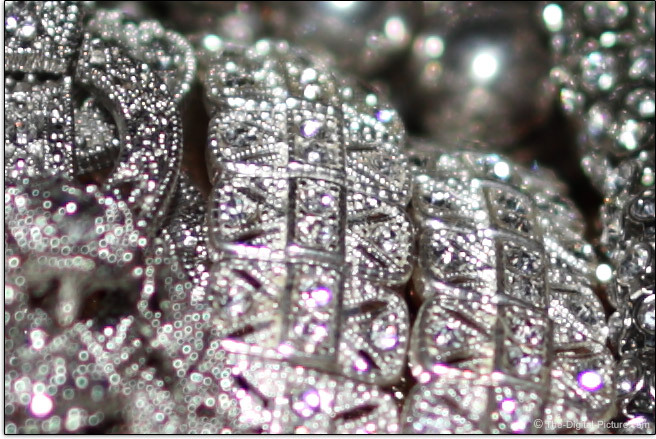 The Canon shows less flare and the Tamron shows slightly less geometric distortion. 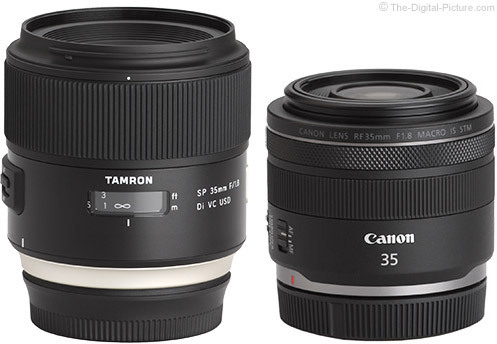 Looking at the specs and measurements, the Canon RF 35mm f/1.8mm f/1.8 IS STM Macro Lens vs. Tamron 35mm f/1.8 Di VC USD Lens comparison shows the Tamron being considerably heavier (though not heavy), modestly larger (though the Canon reaches the same length when fully extended) and with a larger focus ring. The Tamron has a nicely-protective lens hood and some level of weather sealing. The Canon has 52mm filter threads vs. 67mm. Though still falling short, the Tamron comes close to the Canon's 0.50x maximum magnification spec with a 0.40x. The Canon STM and Tamron USD AF systems are a difference. The Tamron is priced moderately higher. Many acquire a mirrorless camera for smaller size and lighter weight while retaining great image quality and the Canon RF 35mm f/1.8mm f/1.8 IS STM Macro Lens follows through with that spirit. This lens is light enough to be carried all day and the 35mm focal length has the general purpose utility to make it a good choice for such extended duration use. Especially with its macro focusing capabilities aiding, this lens has a huge number of subjects available for it. Image quality is quite good and 5-stop-rated image stabilization contributes strongly in that regard. That the price is low wraps up a great little package.